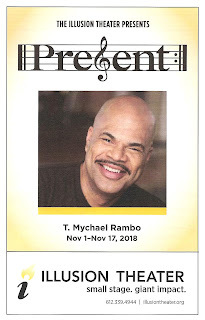 Prior to his one-man autobiographical musical show, T. Mychael Rambo was introduced as "a gift to all of us." So true. I've been a fan of his since I can't even remember when. 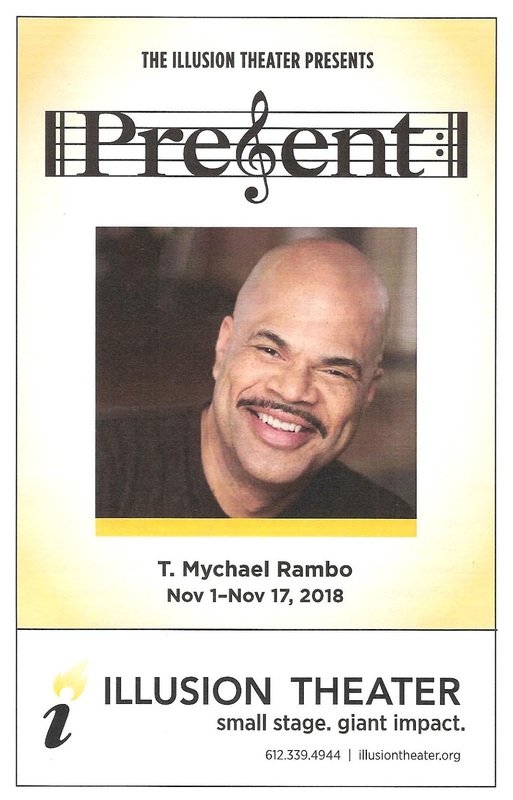 He's performed just about everywhere in #TCTheater, and he always brings his big beautiful voice and plenty of charisma. It's fitting that he titled his show Present, now playing at Illusion Theater, because watching it is a present (meaning gift), as he reminds us to be present (aware, mindful) in the present (now). Only one week remains of the limited three-week engagement, so act fast to see this joyful and life-filled performance. Over about 75 minutes, T. Mychael sings about 20 songs as he tells us fragments of his life experiences. The songs are varied and surprising, from some original compositions, to traditional songs, to pop classics, to a wide variety of musical theater selections (Sondheim! Wicked! Dear Evan Hansen!). In between the songs T. Mychael tells us stories about growing up in Cincinnati and Texas, his colorful family, coming to Minnesota on a one-way ticket to Hazelden, his struggle with depression, his 30+ year career teaching children, and the carjacking he lived through just this summer. It's not a full detailed chronology of a life, but rather snippets, memories, experiences that made him who he is today. T. Mychael is a natural entertainer. He has the audience in the palm of his hand from the moment he steps onstage. He's so great at engaging the audience, it often feels like he's looking right and you and singing just for you. He's accompanied by Roberta Carlson on piano, who is also credited with musical arrangement (and there are some unique and lovely arrangements making familiar songs sound new). Directed by Michael Robins, the show has a nice flow between story and song, between comic and poignant moments. Present continues through November 17 only. T. Mychael shares his heart, his stories, and his musical gift in a way that will warm your heart, entertain you, and leave you wanting more.